Jordan Spieth is an American professional golfer on the PGA Tour and former world number one in the Official World Golf Ranking. He is a three-time major winner and the 2015 FedEx Cup champion. In April 2016, Time magazine named Spieth to its list of the "100 Most Influential People", noting that he "exemplifies everything that's great about sports." 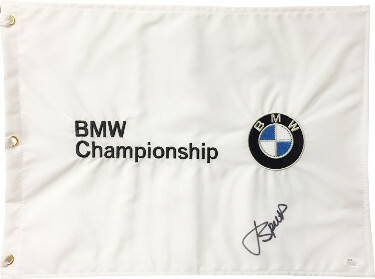 Jordan Spieth has hand signed this BMW Championship White PGA Tour Flag. JSA Hologram #N13267 and Certificate of Authenticity.